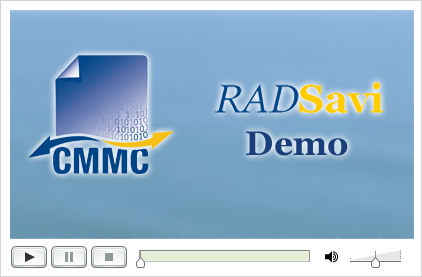 RADSavi, a rapid application development utility for IBM Datacap, is CMMC’s newest product solution developed to accelerate the deployment of IBM’s Datacap application. RADSavi is a set of tools built to leverage the IBM Datacap suite of products for streamlined creation of IBM Datacap applications with large number of document types. CMMC’s RADSavi is specifically designed and implemented to take maximum advantage of systems that use IBM FileNet P8 as a back-end repository. Reduce Datacap development time by 70% or more. Gain extensive upfront savings of at least a third of the normal IBM Datacap implementation cost. Continue to save money with reduced maintenance cost. No need to be a developer when using RADSavi. CMMC’s RADSavi is a proven implementation already in production. RADSavi allows dynamic validation form generation at run-time based on selected or matched document types. RADSavi allows multiple document types to be validated within the same batch. RADSavi allows for export of documents to separate object stores and/or document classes within the same batch. RADSavi fully supports IBM Datacap’s automatic document recognition, classification and data extraction. RADSavi has support for database lookup, drop-down lists population, and field value validation against various data sources. RADSavi has extensive support for native IBM Datacap validation methods and rules. RADSavi has strong background processing capabilities to increase throughput.